Women can be extremely difficult to please. Seriously, just ask any one of them. One day they want to repaint the house, the next day they want the former color back. If you really want to know what women want, you can search all you want and you probably still won’t have an answer. When it comes to looking for presents for women, the entire ordeal can be like a nightmare come true. You want to go for something sweet and simple, but you’re afraid she won’t be satisfied. You dream of getting her a huge gift like a new car, but that requires a gigantic budget that you most likely do not possess. What can you do? The answer is simpler than you thought: pearl jewerly. To be honest, pearls are a woman’s best friend and are the perfect way to make a picky lady happy. It is impossible for a woman to not fall head over heels in love if they receive a piece of pearl jewelry, they are simply too exquisite to not adore. You can always go for a pearl necklace, bracelet or pair of earrings to make a woman happy. However, if you want to get an extra special gift, you should consider pearl pendants. These original pieces of jewelry are as sophisticated as they get; check out some of the best-selling varieties available today on Pearls Only below. Both affordable and charming at the same time, a white freshwater pearl pendant acts as an excellent gift idea. Available with either 925 sterling silver or 14 karat gold finishes, a freshwater pearl pendant is the perfect way to take a classic piece and give it a modern twist. What can mirror a girl’s personality better than the color pink? That is precisely why a pink freshwater pearl pendant should be at the top of your shopping list if you want to please a truly feminine lady. Akoya pearls are regarded around the world as being one of the most breath-taking living gems available. Particularly the Japanese variety is widely appreciated, so it’s natural that a white Japanese Akoya pearl pendant would make a magnificent gift. Truly, nothing can compare to a black pearl. Tahitian pearls are unique beauties that are highly sought after on the market, and you can probably understand why. 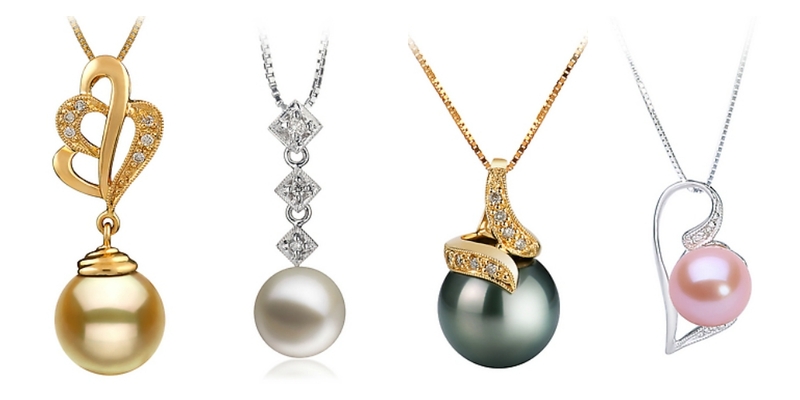 A black Tahitian pearl pendant looks amazing set in both silver and gold, so make any choice you like. If you want an upgrade to white freshwater and Japanese Akoya pearls, South Sea pearls are the answer. These luxurious gems will be treasured by any woman if she receives one as a pendant, so you don’t have to think twice before purchasing. If we could speak about a queen of pearls, the gold South Sea pearl would be the one. A pendant with one of these rare and impressive pearls is the ultimate statement of prestige.